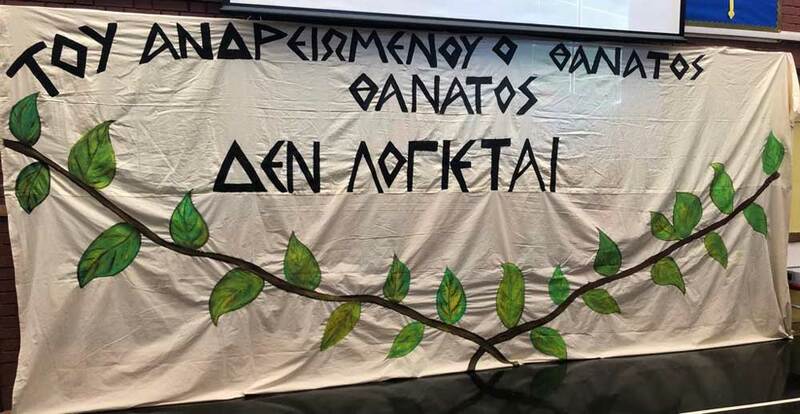 Our school, like every year, celebrated our national anniversaries for the Greek Revolution of March 25th 1821 and the anti-colonial, national-liberation struggle April 1st. The children recounted poems, sang and danced. Our students' creative talents were amazing in the "Decorate an Easter Egg Competition," Imaginatively and beautifully decorated eggs from different age groups. Well done to all the entries and especially those voted winners. Thank you too to everyone who helped. Our Summer Souvlaki event was a great success! Dance, Games and activities for the little ones, raffle tickets and Greek souvlaki for everyone. Celebration of our national anniversaries BRAVO and THANK YOU to all the children who took part in our 25th March 1821 and 1st April 1955 Independence Days’ Celebrations. Congratulations on their amazing performances, not forgetting an excellent programme consisting of poetry, drama and dance arranged by the teachers and staff! Once again, making us proud of their achievements. A huge thank you to all for attending and celebrating with us. We would like to take this opportunity of wishing you all a Happy Easter and welcome you back on Saturday 21st April. On Sunday 4th March the opening of the “Charmed Lives in Greece” exhibition took place at the British Museum. 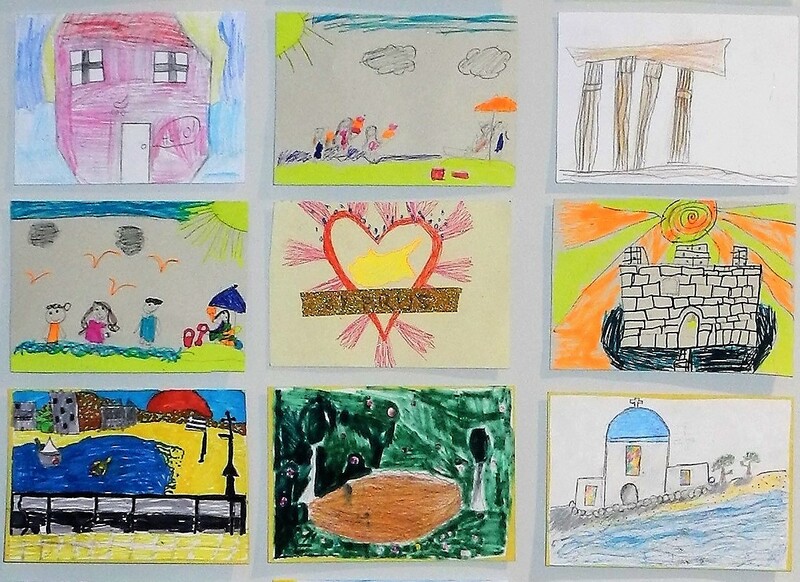 Our students designed their own artwork in the ‘Great Postcard Art Challenge’ inspired by the three artists, which was exhibited at the Museum. The painters, a Greek artist Ghika and two English friends, Craxton and Leigh Fermour painted the landscape in Greece where they lived, Hydra, Kardamyli, Crete and Kerkyra. It was an honour to see the artwork of our students displayed next to the work of these great artists! 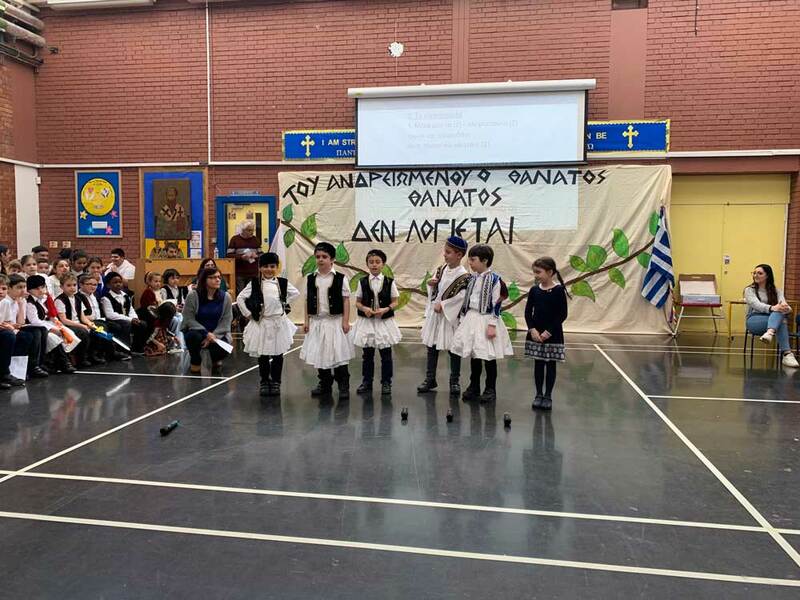 On Saturday 16th December, the Greek Community School at St Cyprian's put on an outstanding Christmas performance. The children and teachers worked very hard to put together an amazing Christmas concert with a wonderful atmosphere. Performances of acting and singing from each class were exceptional to say the least! This year the Committee extended their invitation to members of the elderly community to attend the festivities. They were presented with beautiful Christmas hampers and had front row seats for the performance. 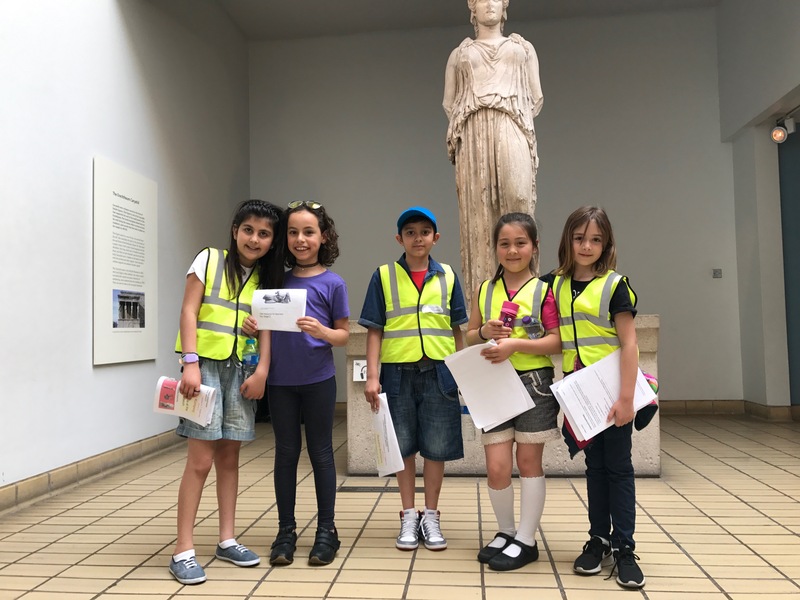 They were extremely grateful and expressed their thanks to our head teacher Mrs Antonia Kastelanides for the invitation. It was lovely to hear how much they enjoyed the day and how welcome they felt. Once again, a proud moment and great opportunity for our community to come together at the Greek Community School at St Cyprian's. We would like to thank everyone who attended our Christmas concert and for the support and help on the day. It made our Christmas celebrations feel special! We wish you all a Merry Christmas and a Healthy, Happy New Year. Dance, Games and activities for the little ones, raffle tickets and Greek souvlaki for everyone. 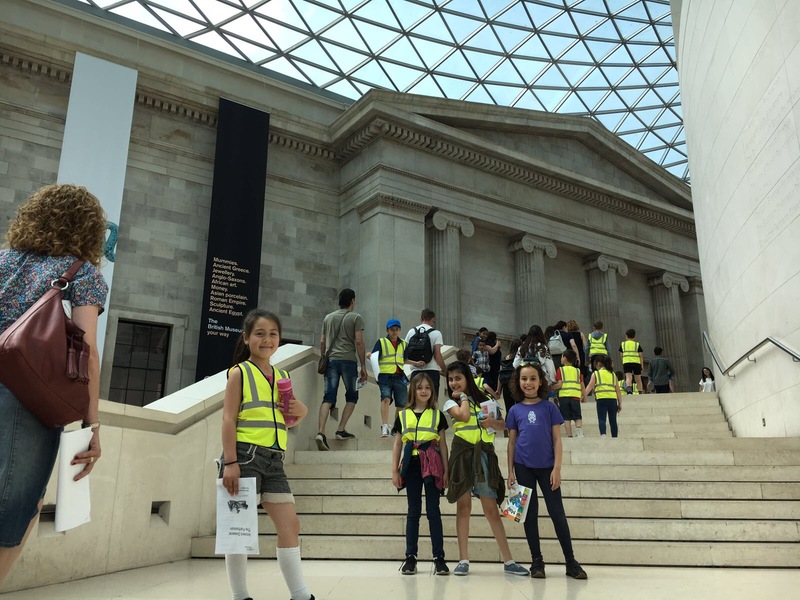 During the entire month of May, the School bravely embarked on taking all year groups to the British Museum to have their Greek School lessons in an altogether different setting from their usual classrooms. The children recounted poems, they sang and danced. We had record numbers of families and everyone enjoyed the lovely weather and great food! Live music, dance, Games and activities for the little ones, raffle tickets and Greek souvlaki for everyone. Thanks must go to a hard working group of teachers and equally hard working parents' committee and parents for their food donations. 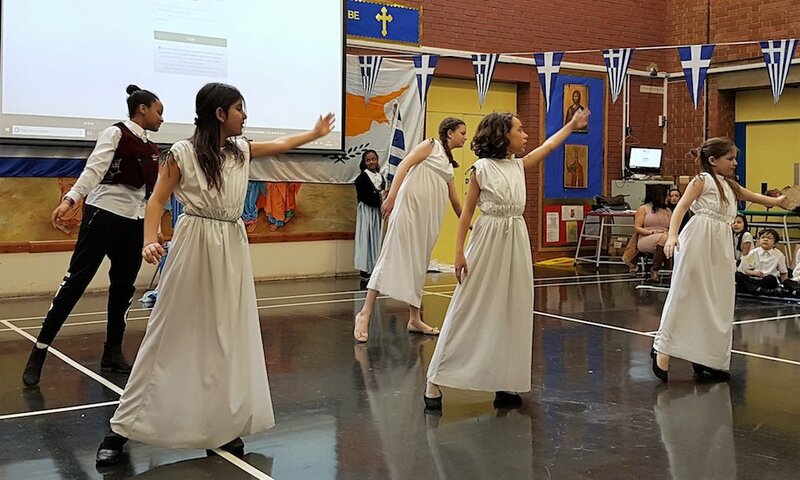 The celebration with its 'Greek to Go' takeaway was a huge success raising £ 800 for the school. A huge THANK YOU to one and all. 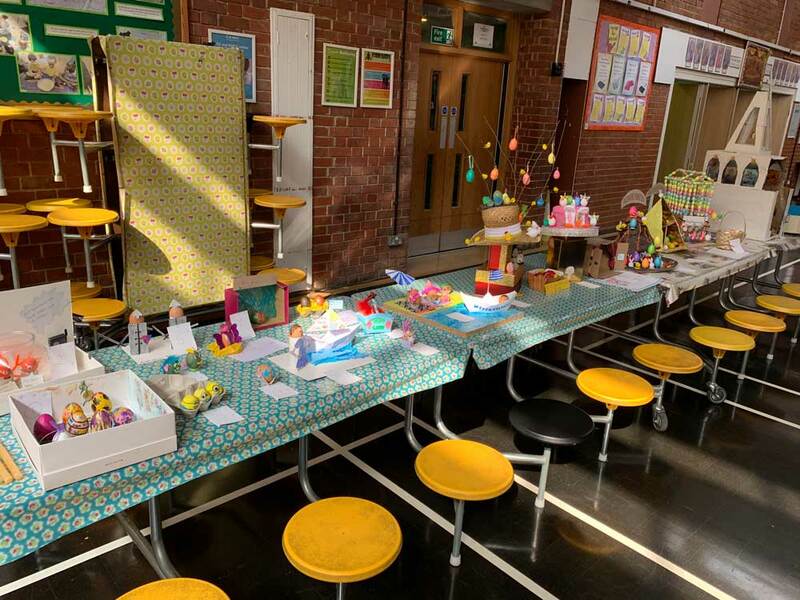 Our students' creative talents were amazing in the "Decorate an Easter Egg Competition," which took place on the 20th April at our Easter Festival. Imaginatively and beautifully decorated eggs from different age groups. Well done to all the entries and especially those voted winners. 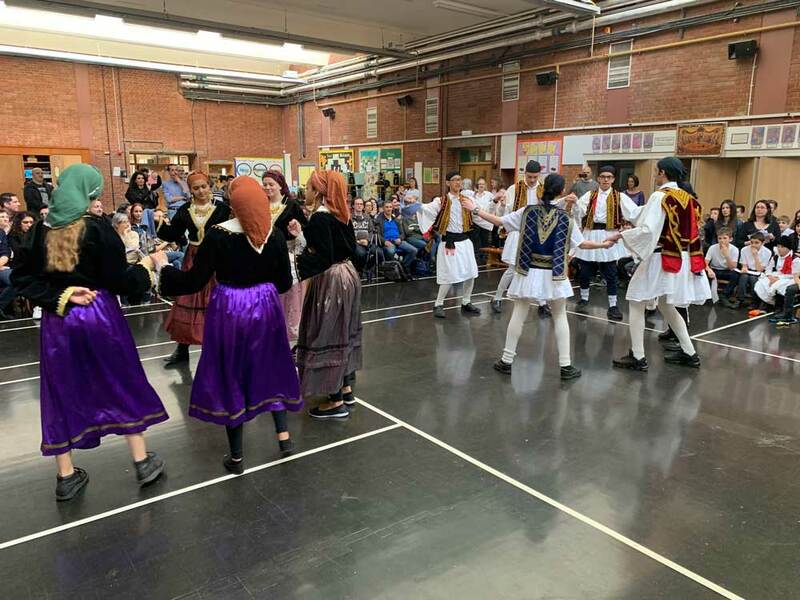 A fantastic time was had by everyone on Sunday at the jointly organised Dinner and Dance by the Community School at St. Cyprians and St. Marys Camberwell Greek School. The vibrant and lively atmosphere created by our young students was amazing and they all left asking for more. Our dance group on e again made us all very proud as they danced to the enthusiastic applause of the entire hall of parents and friends. Thank you to everyone who worked so hard behind the scenes to make this event such a success but especially to Christina and Erico who came up with the idea and for the excellent collaboration. Here's to the next joint event. Well done to all the children who sang beautifully and danced brilliantly at the ALKIONIDES charity fair. Made us all very proud!